Belvelly Tower House, Cobh, Co Cork dates from 16th Century. On tonight's episode of The Great House Revival, host Hugh Wallace follows the journey of Garry and Anne Wilson as they embark on a challenging and costly restoration project at Belvelly Tower House in Co. Cork. Click through the gallery above for a sneak peek. Belfast born Garry and Anne have lived and worked in the UK all of their adult lives but have always dreamed of having a base in Ireland. "We both grew up in Belfast in the 70s and 80s", says Garry. "Belfast was a dark place back in those times, there weren’t the opportunities for our generation so we had to move over to England, but we want to keep a connection to Ireland, we are not very far away, we have still got lots of family who live here, and this will give us a base back on the island." 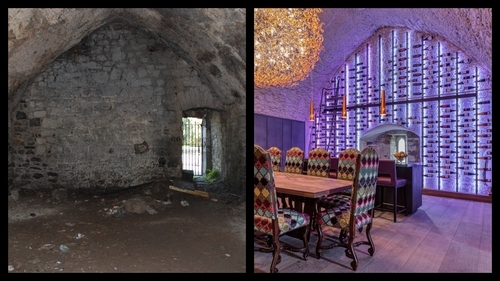 In 2016, the two were in the market for a restoration project and came across Belvelly Tower House in Cobh Co Cork, a building that dates back to the 16th Century. The tower hasn’t been lived in for nearly 400 years and was at the point of no return when the two decided to invest their savings into bringing it back to life. When they bought the tower, it was a ruin with ivy covered walls, it even had a tree growing out of the top of the tower. As well as their blood, sweat and tears, the two were estimating a total cost of €5 million. "I have to admire Garry and Ann for taking on such an unknown entity, there is no way of accurately budgeting for a project like this because you will be hit time after time with surprises. They have chosen to save a national monument, but at what personal cost, and will they feel it was worth it in the end?" Hugh Wallace. The total spend on this project is estimated to be approx €5 million. Watch The Great House Revival every Sunday at 9:30pm on RTÉ One or catch up on RTÉ Player.